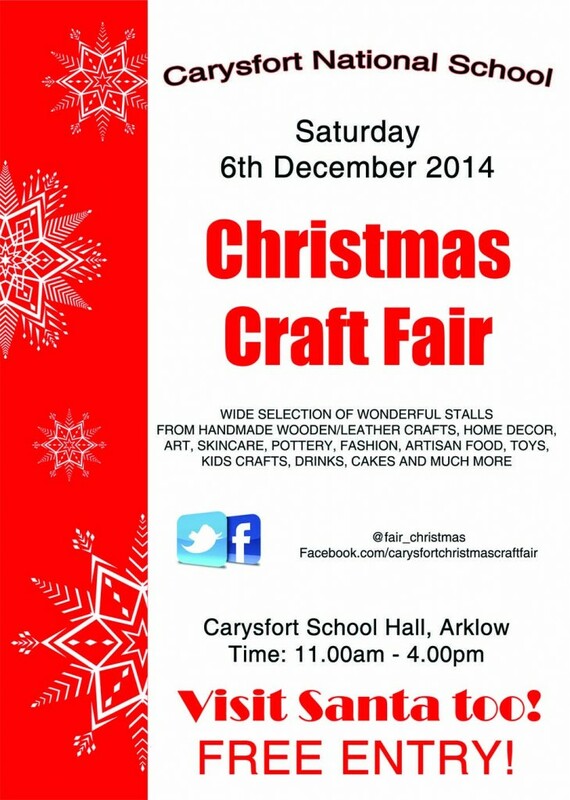 The Annual Christmas Craft Fair at Carysfort N.S, Arklow is to be held on Saturday, 6th December from 11am to 4pm. The event has over 40 local stall holders. The Christmas Craft Fair has been running for a number of years with growing attendance each year. The Christmas fair is unique in that it promotes local cottage industries ranging from crafts, artisan products, seasonal giftware, toys, fashion, home décor, beauty products and jewelry as well as many more exciting giftware ideas to suit every pocket. There will also be a coffee shop with homebaking, cakes and sandwiches. For the younger visitors there will be pottery making, face painting and if they have been really good this year they can visit Santa at his grotto. Be sure not to miss the Carol singers and spicy apple drinks to get you into the festive spirit. This is a great opportunity for people to see firsthand the fabulous local produce available to the area. A one stop destination for unique Christmas presents, ambience and even the chance to purchase your Christmas trees and wreaths. The fair will be held in Carysfort NS, Knockenrahan, Wexford Rd., southside of Arklow (at the roundabout after passing Lidl on your right and Tesco on the left). FREE ENTRY. Like us on Facebook facebook.com/carysfortchristmascraftfair for updates and more information about the Craft Fair.